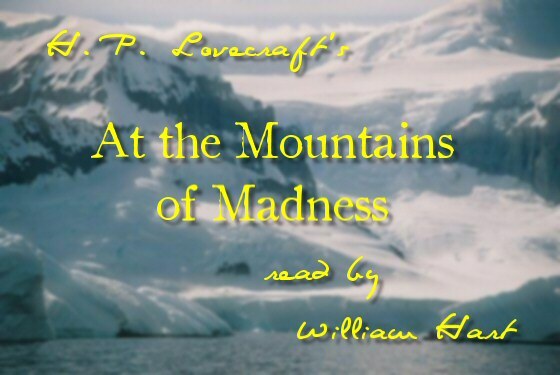 ← H. P. Lovecraft’s, “At the Mountains of Madness” Chapters 01-04 Read By William Hart Are Now On YouTube! I have already recorded the first five chapters, but I’ll then work on each of the final seven chapters one-at-a-time after I get the first batch posted. Chapter Six is coming soon, but will take a little longer with holiday activities! This entry was posted in 1920's, 1930's, 3D, At the Mountains of Madness, Audio, Audio Book, Audiobook, Book, Books, Fiction, Free, Guillermo del Toro, H. P. Lovecraft, James Cameron, MP3 Files, Readings, Universal Studios, William (Will) Hart and tagged 1920's, 1930's, 3D, At The Mountains of Madness, Audio Book, Audiobook, Book, Books, Cameron, del Toro, Fiction, Free, Guillermo, Guillermo del Toro, H. P. Lovecraft, James Cameron, Lovecraft, MP3, Readings, Universal. Bookmark the permalink.